If you live in an older house and you just bought a new electric dryer, you may have trouble plugging it in. 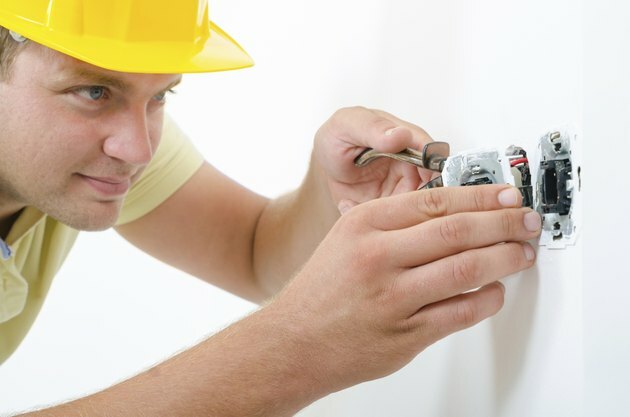 The National Electrical Code has required grounding for 240-volt circuits only since 1999 -- before that, such circuits were grounded through the neutral wire. As a result, contemporary 240-volt appliances, such as dryers, have four-prong plugs, while older outlets have only three. It isn't easy to convert an ungrounded 3-prong outlet to a grounded 4-prong one -- the solution is typically to replace the dryer cord. Retrofitting a dryer outlet is a job for an electrician. In North America, power is carried to the main residential panel by two hot wires, each at a voltage of 120 volts relative to the neutral, or return, wire that completes the electrical circuit with the transformer on the power line. The voltage between these two wires is 240 volts. Most circuits in the house run on 120-volt power and require only one of these wires, but larger appliances run more efficiently on 240-volt power and require both of them. People variously refer to 240-volt circuits as 220-, 230- and 250-volt ones -- these all mean basically the same thing. If you want to replace your three-prong dryer outlet with a four-prong one, you have to run a ground wire back to the panel and connect it to the panel's ground bus. An alternative would be to ground the outlet separately to a metal stake driven into the ground or possibly to a suitable metal water pipe. Either way, it's a job for an electrician, and it usually isn't necessary, because there's a better solution. You can simply replace the cord on your new dryer with one that's compatible with the outlet. When discussing electric dryers, a pigtail refers to the cord that extends from the back of the appliance. Outlets and plugs for 240-volt appliances come in a variety of configurations that depend on the current rating of the circuit breaker. Since most dryers operate at 30 amps, there are only two possibilities for dryer pigtails -- a three-prong configuration and a four-prong one. You can buy both three-prong and four-prong dryer pigtails at most hardware stores. The pigtail connects to the dryer terminals, which are behind the electrical plate on the back of the machine, near the floor. After unplugging the dryer, removing the plate, and backing out and removing the screws holding the four wires to the terminal, remove the old pigtail. Before installing a three-prong replacement, you must connect the neutral terminal to the ground one -- there is usually a bonding plate in attached to one of the terminals for this purpose. You then screw the pigtail wires to the two hot and the single neutral terminal and simply leave the ground terminal disconnected. You can now plug the dryer into a three-prong outlet.